Eight days after being shot by an assassin at the Pan-American Expo, President McKinley died on September 14, 1901. 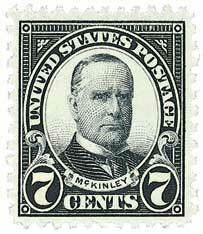 Less than a year before, McKinley had won re-election. Following his March inauguration, McKinley and his wife, Ida, began a national tour. But when Ida fell ill, they postponed the last stop, the Pan-American Exposition in Buffalo, New York, until later in the year. On September 5, McKinley addressed some 50,000 people at the fairgrounds, with Leon Czolgosz among them. Czolgosz was an anarchist who wanted to become a hero. U.S. #2346 pictures the former national capital at Federal Hall. The building was later demolished in 1812. 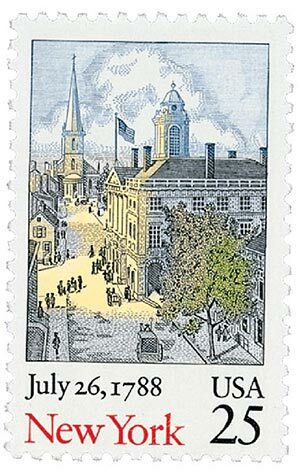 On September 13, 1788, New York City was established as America’s first capital under the Constitution of the United States. New York had already hosted the nation’s legislature and served as the de facto capital since 1785. In late 1784, the Contental Congress, operating under the Articles of Confederation, voted to make New York City it’s meeting place until a federal district on the banks of the Delaware River near Philadelphia could be completed. They chose Old City Hall, which was then renamed Federal Hall, to serve as capital building. Federal Hall was then redesigned by Pierre Charles L’Enfant, who later became famous for designing the layout of Washington, D.C. Congress met for the first time in Federal Hall on January 11, 1785. 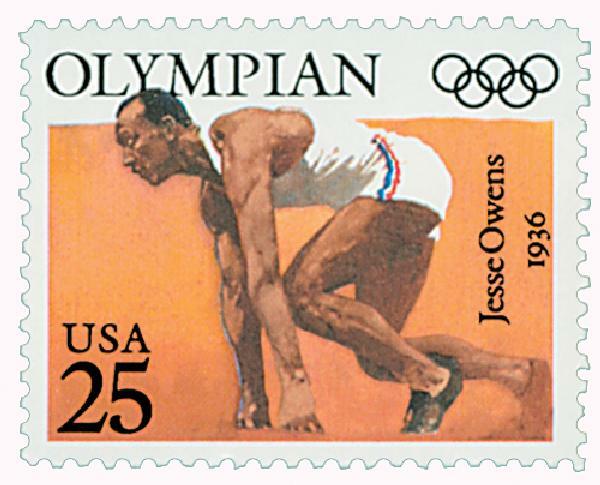 Born on September 12, 1913, Jesse Owens broke several track and field records and won four Olympic gold medals. He was ranked as the greatest athlete in the history of his sport. The youngest of ten children, Owens spent his childhood in Alabama and then Ohio. He took on various jobs as a child to help out the family, including delivering groceries, loading freight cars, and working in a shoe repair store. He discovered his passion for running at an early age, which eventually earned him national attention in high school when he tied the world record for the 100-yard dash. 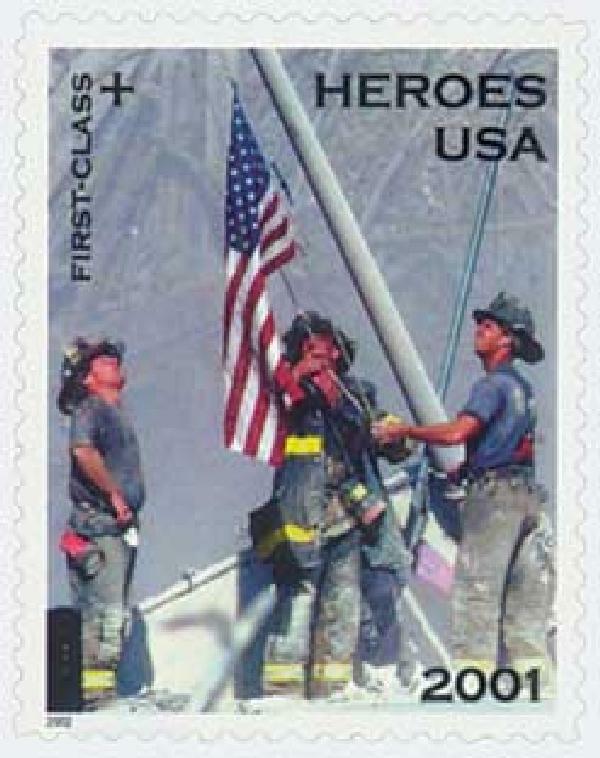 U.S. #B2 – This Semi-postal stamp raised funds to assist the families of emergency relief personnel killed or permanently disabled in the 9/11 terrorist attacks. At 8:46 a.m. on the morning of September 11, 2001, American Airlines Flight 11 crashed into the North Tower of New York City’s World Trade Center, changing our world forever. Before the day was over, close to 3,000 people would lose their lives, and countless heroes would be made. From that day forward, the term “9/11” would symbolize both disaster and heroics. One of the most enduring images of the day was captured by photographer Thomas E. Franklin, and is pictured on the U.S. semipostal stamp, #B2. U.S. #892 – Howe went on to serve in the Civil War, using money he’d earned from his sewing machines to outfit his regiment. He also worked as the regiment’s postmaster, delivering war news. 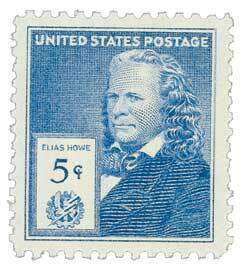 After eight years of tinkering, Elias Howe was awarded the first U.S. patent for a practical lockstitch sewing machine on September 10, 1846. Howe didn’t invent the first sewing machine – various forms of mechanized sewing had been used as early as 1790. Over the years, various inventors created and even patented sewing machines, but none produced a durable enough stitch to replace hand-sewing. Walter Hunt came close in the early 1830s. He invented a back-stitch sewing machine, but refused to patent it for fear of the jobs it would take away from seamstresses. Meanwhile, in Massachusetts, Elias Howe was working for machinist Ari Davis. Davis once told Howe that whoever invented a practical sewing machine would be rich. And so, Howe set about being that man. He worked on the machine for eight years in his spare time, working out the logistics.